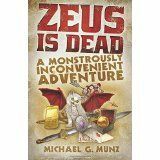 Terry Pratchett meets Douglas Adams in this farce of Greek gods returning to modern times. Though legions of geeks on the internet refer to the Idiot Ball in strictly tropological terms, the actual Idiot Ball does exist in the Muses’ Hall of Creative Abstract Concepts on Olympus. It very much resembled a golden golf ball, save for the fact that it was without dimples . . . . And Dionysus was now carrying the Idiot Ball. The premise: in ancient times, the Greek pantheon of gods was banished from our world by Zeus, and in our time fellow gods who were chafing under his restriction figured out how to remove the ban, by killing Zeus. There follow prophecies and artifacts and all the usual politics and self-serving attitudes of the classical Greek gods – but each hilarious chapter starts with relevant excerpt from their blogs, Twitter feeds, television interviews and celebrity rags that follow the Olympians like paparazzi puppies. The gods have reality shows. Dionysius runs Las Vegas. Apollo is appalled at it all, and wants things back the way they were, but is constrained by not knowing who the killer or conspirators are. With the help of his Muses—who are now inspiring sitcoms and science fiction, etc—Apollo follows vague prophecies and accosts mortals, in places like Starbucks. The saying might be, “Whom the gods want to destroy, they first make mad,” but in this case it’s more like, “Whom the gods think might destroy something, they cover in madcap chaos.” The Large Hadron Collider and the God Particle get involved. The fourth wall gets broken repeatedly, with you asking for more. And Cerberus get groomed like a poodle. I have not enjoyed a tongue-in-cheek comedy book this much in a long, long time.